1) Slow stew beef or lamb for an hour and a half, adding Elbabour's Spices for Meat Stew mix about halfway through. Half an hour before meat is cooked, add salt. When meat is done, remove from heat, strain water out of the pot and set aside. Also set the meat aside. 2) Meanwhile, fry up thinly ground minced mutton in a pot with vegetable oil. When meat is half cooked, add Elbabour's Spices for Frying Ground Meat and finish cooking before removing from heat and setting aside. 3) Wash the freekeh thoroughly. Boil washed freekeh in the water from stewing your beef/lamb, adding salt and Elbabour's Spice for cooking freekeh (one teaspoon of spice per cup of freekeh). Until cooked. 4) Heat all ingredients you have prepared. 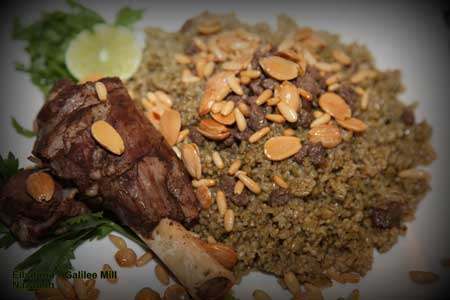 Pour freekeh onto a large, flat serving dish, sprinkle with fried minced meat, add the large pieces of meat around the dish, and top with pine nuts and roasted almonds. Serve with cold yogurt. Enjoy!